Admitted undergraduates receive a brochure entitled Now that You’re Admitted from Undergraduate Admissions. This document provides information about the essential steps you must complete as part of the enrollment process. This document also outlines instructions for accepting admission and registering for a New Student Conference. Read through these materials carefully and use the online New Student Conference Registration system to accept or decline admission to the university. We recommend you keep this booklet for reference, as it contains information that will help you prepare for your first semester at Texas A&M University. Admitted undergraduates are mailed the New Student Conference Handbook in April after registering for a New Student Conference. The New Student Conference Handbook provides details about the conferences, tips for making a smooth transition into university life, and resources for campus services that an incoming Aggie might need. Read through it carefully, share it with your family, and bring your copy with you to your New Student Conference. For Spring Admits, a condensed version is mailed with your confirmation letter. Issued by the Office of New Student & Family Programs three times per year, the New Aggie News informs newly admitted students about upcoming events, campus policies and services, timelines for New Student Conferences, and decisions that need to be made prior to enrolling or arriving to attend the first semester of classes. Received at your New Student Conference, this publication is full of information about the university, student services, student organizations, and much more. 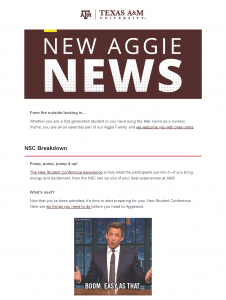 Parents of first-year Aggies receive this newsletter from the Office of New Student & Family Programs twice during their student’s first year at Texas A&M. The Aggie Connection Newsletter provides information on campus events, issues facing first year students and updates on campus resources. The newsletter is available online at parents.tamu.edu. 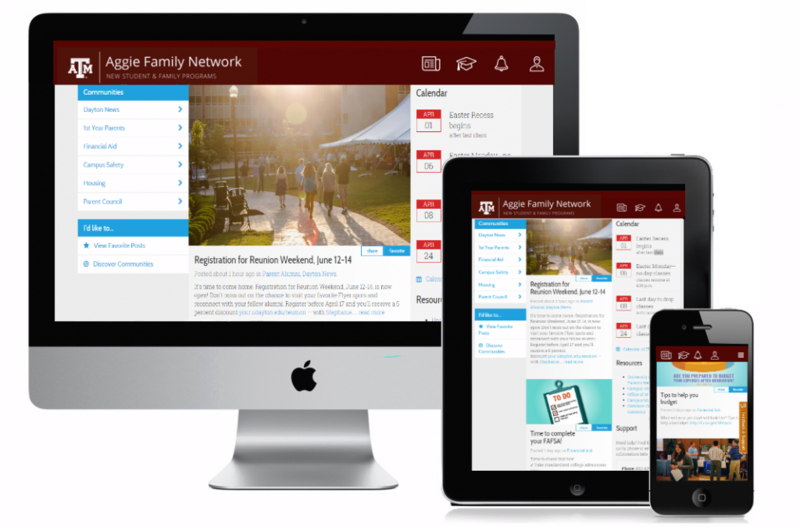 The Aggie Family Network Portal allows you to customize the information you receive from Texas A&M. Thanks to the new platform, e-newsletters from the Office of New Student & Family Programs will now be tailored to your interests. You can decide how often you would like to receive updates, as well as log on 24/7 to view content or make account changes. Sign up for the portal and newsletters at tx.ag/FamilyPortal. Once a member of the Aggie Family Network, you will have access to a specially curated news feed, calendar of important dates, helpful resources and more! Designed specifically for family members by the Office of New Student & Family Programs. Registered family members and guests will receive a Family Calendar at Family Check-In when you check-in for your student’s New Student Conference. The Family Calendar serves as the family guide to helping students through the first year of enrollment at Texas A&M. Note: Families of new students receive one calendar included with their registration when checking in at the New Student Conference. The Family Resource Guide is designed to introduce family members to many vital resources available on Texas A&M University’s campus. 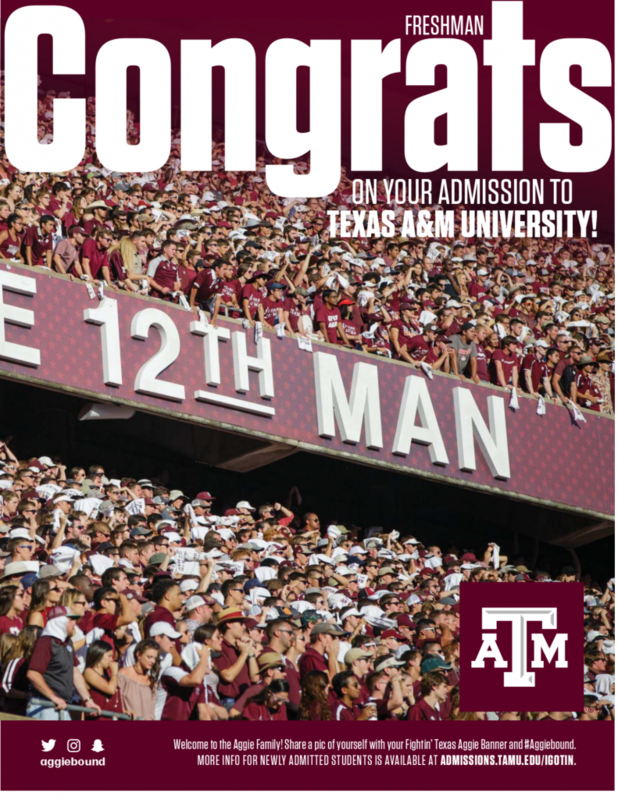 The publication offers detailed information on health and safety resources, academic information and important University dates, and insights to campus life that will help family members support their students during the first year and throughout their time at Texas A&M. Read the Aggie Family Resource Guide here. To view PDFs, you must have Adobe Acrobat Reader installed on your machine. Visit Adobe Reader to download this free plugin.